Party Poker must have a giant Christmas list to take care of this year because they’re offering free daily presents to all of their members. As if this isn’t enough, Party are also giving out a number of big prizes to certain VIP members this month. With so much going on at this site in December, let’s get straight to the promotions! 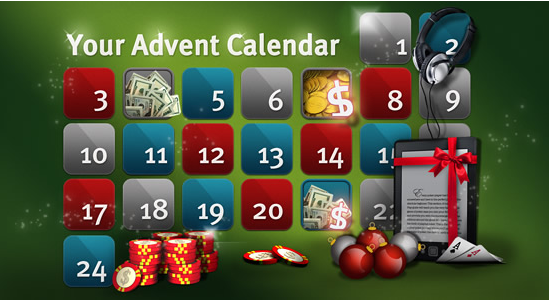 From now until December 24th, 2012, you can receive a daily present from Party Poker, which could be anything from a Kindle Wi-Fi to cash. The only requirement behind receiving a present is that you have a real money account and log in before midnight when the daily gift expires. Bronze VIP Level – 3 points per present, top prizes are $10 or 300-piece chipset. Silver VIP Level – 15 points per present, top prizes are $50 or Sony headphones. Gold VIP Level – 30 points per present, top prizes are $100 or Kindle Wi-Fi. As for Prizes 1-6, you get to choose with your voucher. For example, if you won Prize 6, you’d could choose between a Samsung galaxy Tab 2 (10.1), Apple iPod touch, Ray-Ban Gold Aviators, Sony 3D Blu Ray Home Cinema System, WOWEE, iPod Nano 8GB & Apple headphones bundle, 3D Connexion Spacemouse or Xbox 360 250GB & Kinect. Anybody who decides to treat themselves to the fantastic December promotions should sign up for Party Poker rakeback through RakeTheRake. By doing this, you ensure that you’ll receive a 100% up to $500 sign-up bonus along with up to 50% rakeback.